Safety Fuse kit 1928-34. Why burn up your model A when you can save it with this nifty little device. Installs easily on the starter switch using the same starter switch mounting holes. Complete authentic looking unit with an extra fuse & correct length mounting screws. Made in USA. Safety Fuse Mount Set for the 1928-34 Fords. When adding a safety fuse, you will need two longer screws to mount it. These are the two screws with the lock washers. (these are included when you buy the safety fuse kit). Made in USA. Cut-Out ToTerminal Wire 1928-Early 30. This style of wire was encased in steel conduit, and was used from the beginning of production until Feb. Of 1930. Comes in primer. Made in USA. If you want to use your original metal tube for the cut out to terminal box wiring harness, this is the kit to rewire it. 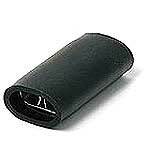 You will have to attach two wire ends after the wires are slid through the metal tube. Cut-Out To Terminal Wire 1930-31. This fabric covered wire was used from Feb. Of 1930 through the end of production. 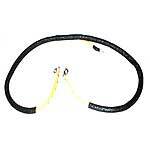 This harness has the flexible black loom instead of the steel conduit that was used up to this point. Made in USA. Coil to Terminal box wire 1928-31. 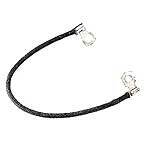 This is the black cloth covered wire with correct soldered ends. Made in USA. Terminal Box To Dash Wire 1928-31. Exact copy of the original with heavy correctly coloured wire as well as the correct end clips. Made in USA. 1928-31 Model A Ford Lighting Wire Harness, wired for 1 Bulb in the headlight. This harness is normally used when you have cowl lights. The one bulb harness has the cowl light harness in it. Made in USA. Lighting Wire Harness 1928-31 2 Bulb without Cowl Lights. Made for one or two bulb headlights. If you have a two bulb headlight and want to use cowl lights - just add the cowl light wire to parking light terminal. The one bulb harness has the cowl light harness in it. Made in USA. 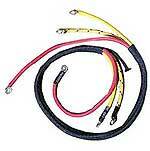 The correct black and blue cloth covered wire to run from the terminal box to the wiper motor. Has the special flag connector. The small wire ends that get crimped onto the wire ends to plug into the A-14487 wire connectors. Made in USA. These are the correct authentic style flag terminal used throughout the Model A wiring harness. Preformed tinned brass. Set of 5, made in U.S.A. These are the special terminal ends on the main wire harness that matches with the head light wire socket, which is located in the wire plug. To install drip solder into the terminal then push the copper wire into the solder. Set of 6. These female connectors were used to connect one harness to another. Accepts the bullet style wire ends. Wire Connector 1928-31. These female connectors were used to connect one harness to another. Accepts the bullet style wire ends. These double female connectors were used to connect one harness to another. Accepts the bullet style wire ends. 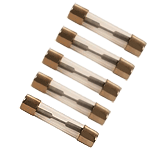 Each set contains 4 connectors. A pack of 10 wire clips for holding the wiring onto the frame rails. Made in USA. 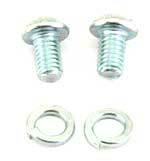 Water inlet Wire Clip Bolt 1928-31. 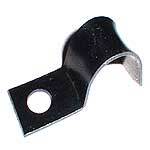 The short fine threaded bolt and l/w used to mount the A-14577-A wire clip to the water inlet. Made in USA. A pair of 12/24 round headed machine screws with lock washers to bolt the oval style starter rod cover to the firewall. Also used on the firewall, to hold the speedo cable clip and the terminal box to cutout cable retaining clip. Made in USA. This is the clip that holds the main lighting wire harness on the left chassis rail. It is fitted using one of the retaining bolts on the front left bonnet latch.